Dogs Luv Us and We Luv Them: We Are Honored To Receive The Versatile Blogger Award! 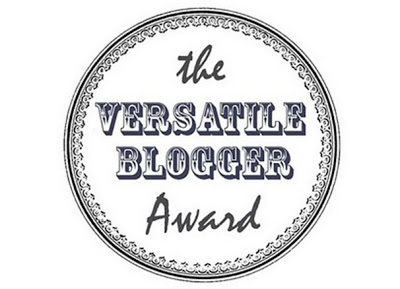 We Are Honored To Receive The Versatile Blogger Award! I just had such a nice surprise! I visited one of my favorite blogs, Barking From The Bayou authored by my friend M.K. Clinton. As I read, I found out she nominated us for the VERSATILE BLOGGER AWARD!! I'm so honored to be one of the blogs Melissa included in this peer to peer blogging award nominations. One of my first blogger friends when I started blogging, Melissa writes about the wonderful and exciting life she shares with her two beautiful and spirited dogs, Bentley the Basset Hound and Pierre the Westie. She is also the author of the books The Returns and The Returns Showstoppers, available on her site and on Amazon.com. I love these books, they're a pet lovers delight! 1. Give thanks to the blog/blogger that gave you the award with a link to their blog. ✅ Done! 2. Select 15 blog/bloggers that you would like to bestow this furbulous award. Only 15?! ✅ Done! 3. Shine a spotlight on the lucky Versatile Blogger Award winners with a link to their site so your readers can discover them. Here are my picks, although it was SO hard to narrow it down to just 15! 4. Lastly, tell your nominator and readers 7 interesting things about yourself. OK, I'm really not that interesting but here it is. ✅ Done! ✦ I was born and raised on Long Island, New York. I went to college and subsequently lived in New York City, which was a real party all through my 20's and into my 30's! ✦ In college I worked part time as a hair color consultant for Clairol. I helped people who failed to read the directions fix their green, purple, or otherwise ruined hair. Employees got free product so every month I had a different hair color! ✦ I trained my Siberian Husky Icy to be a therapy dog and together we volunteer in our community. I love the children's reading program best, it's so fun and rewarding. ✦ I took a job transfer from New York to Phoenix Arizona in 2006 and lived there for over 9 years. That's where I got both my dogs, Icy and Phoebe. It's the most dog friendly city I've ever been to! I miss it. ✦ I became a certified scuba diver when I was young, but these days I do more snorkeling than diving! I'm not quite as fearless now. ✦ I am completely addicted to chocolate. Whether it's Godiva or Hershey's, I cannot resist! ✦ I love to cook and bake. I covet 2 family recipes that I keep saying I'm going to share but I don't. One is for Carrot Souffle and the other is Apricot Walnut Tarts. Maybe I'll share it one day...... maybe. LOL! A giant Thank You to my friend Melissa of Barking From the Bayou for nominating us! Check out her blog, and stop by the other blogs on the list of bloggers I nominated for the Versatile Blogger Award! I hope each of my nominees will accept this nomination display the award badge, and join in! Thanks for including me Cathy!! And wow, maybe I was one of the people you spoke with years ago because I did some dumb things with hair color back in the day! Scuba diving is something I've never tried so I'm impressed that you were certified so young! I have enjoyed snorkeling and think I might stick to that - lol! Thanks again. Looking forward to speaking next week. You're so welcome Kristin, you are definitely a Versatile Blogger! I'm laughing that you were one of the folks who had hair color issues, LOL! I loved diving, I'm sad that I haven't gone in so many years - it's amazing. Hi Cathy - Thanks again for the nomination! I'll be standing in line with pen and paper whenever you decide to share that Carrot recipe. You're very welcome Cathy! I'll have to think about letting go of that recipe - I'm so weird, I covet my special recipes so much LOL! Why do I do that?? Yay! Thank you so much for all of your kind words. I love you and your blog ♥ I can't believe you helped people after hair color disasters. LOL! My daughter is also a trained scuba diver but she no longer goes either. Skipper is my choca-holic! He LOVES it. My sister-in-law gave me her carrot souffle recipe and it is to die for! You are so welcome my friend, they are well deserved! Thank you for nominating me, I so appreciate that. The hair color consultant was a very interesting job to say the least. We'll have to compare recipes! Awww, thank you for the nomination Cathy! I needed your hair help years ago! I had been dying my hair red for a few years in college. I decided to go back to my brown hair, but chose a shade much too dark. My hair had that blue Brillo tinge all over. I bet being the person who solves hair color problems has some serious job security. And now I have to figure out who I'm going to nominate...hmmm...I have a few ideas to pass this forward! You're welcome Irene! I'm happy to nominate you, I love your blog. So you were one of those ladies who developed dark as we called it - and turned blue too! Double whammy. Whenever that happens you usually correct with a color whose base is opposite of that - the most common is people getting green hair, so you correct with a "warm" shade which has more red tones to counteract the green. I think for blue hair you'd do the same, use a very warm tone w/ a red/orange base. EEP! LOL I have a post coming out TOMORROW nominating you and look you are already an award winner! Oops. I also see you nominated some that I did. It's a beautiful thing isn't it! So many wonderful bloggers! Congratulations on your award!!! Aww you are so sweet to nominate me Joely Thank You!!! I think it's ok that some of us nominated the same people, it shows we are a close knit group with a wonderful sense of community!